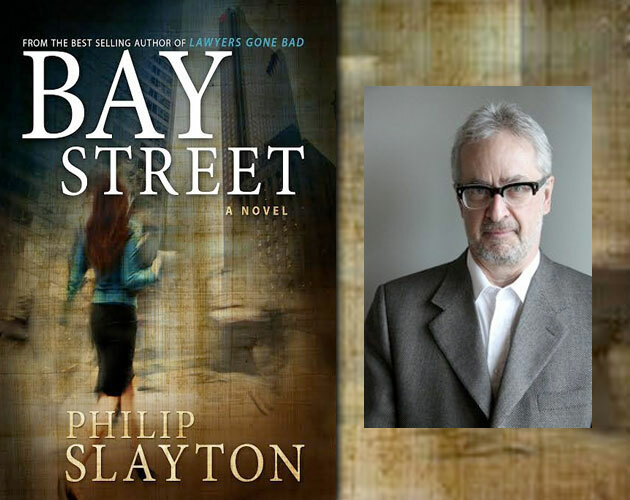 Bay Street, a lighthearted mystery set in the cat-and-mouse world of corporate law, was published this month. Slayton turns 70 this summer. The added value is the rare insider expose of how lawyers behave when nobody’s looking, how they bill clients and how the office politics play out among the partners. And if Slayton didn’t get around to writing his novel until he was getting old, well, he was busy with other things. And still is. Currently president of PEN Canada — the association of writers that protects and promotes freedom of expression — he’s published non-fiction books including the bestselling Lawyers Gone Bad. He’s been a partner in a high-profile corporate law firm on Bay Street, dean of law at the University of Western Ontario and a Rhodes Scholar. He also started taking piano lessons three years ago because learning to play the piano was something he always wanted to do. He even takes the exams and is practicing to pass Grade 4, despite the fact that the waiting room for the exam is filled with a bunch of nervous 8-year olds and their parents. But writing a decent piece of long form fiction was always simmering on the back burner. Approaching 70, he decided it was time to turn up the heat. It took him about 18 months of hitting the keyboard, with interruptions. He approached the novel as a fictional counterpart to his provocative book about bad lawyers. His starting point, he explains, was the main character, a junior partner with the felicitous and unforgettable name of Piper Fantouche. From another author, actually, a very famous one. Slayton says the prolific Scottish author was also talking about how he writes four novels a year — one every three months — and how this has made him extraordinarily rich. “I heard this and I thought, ‘I can do that,’ “ quips Slayton. Women, he says, have “a particular set of difficulties” in big law firms or banks. Although Penguin has published his non-fiction, Slayton chose to self-publish his first novel. He’s now working on another non-fiction book for Penguin about Canadian mayors and already has been thinking about a sequel to Bay Street: A Novel. He also wants to write more serious fiction and has had for some time a project of that nature in mind. But, he admits, “I do have a variety of ambitions.